A Biibox playground is predominantly metal in construction and designed to offer users between 2 and 12 years both adventure and strong sensations. It acts as a meeting point and encourages social interaction. The Biibox range has a modern look and feel, with many stylish elements designed to maximise the play opportunities. Designed like a town, the playground provides a meeting point for children aged 2 to 12 who want to test and develop their motor skills. This provides opportunities for children who are eager to find excitement and adventure, and other children to talk to. The platforms, at 4 different heights (1.17m to 1.95m), are linked by floating walkways, tunnels, slides and climbing nets. A sense of balance and the ability to overcome heights are put to the test here. Equipment such as the climbing wall, cableway, gyro and other moving elements can be added to extend the trail. They bring many extra challenges, and provide an enhanced level of movement and fun. The style of the Biibox range is resolutely contemporary, with a look that combines flowing curves with predominantly metal materials, highlighted by brightly coloured panels. Most of the combinations are available in 4 versions: stainless steel for an original approach, aluminium for a warm design, compact material for a classic touch, or tubes for a contemporary, transparent look. 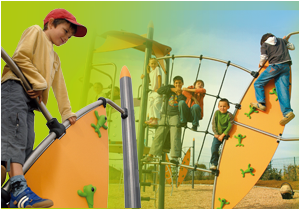 Its modular design allows a solution to be found for all requirements and enables the playground to fit effortlessly into the surrounding environment.